In a process lengthier than many had hoped, California is moving toward removing toxic products from the market, one by one. Today, officials announced the first three proposed targets: nap mats used by small children in schools, spray polyurethane foam used as insulation and a commonly available paint stripper that has been implicated in the deaths of 13 workers who were refinishing bathtubs, according to the Centers for Disease Control and Prevention. The decision on which items to target isn't yet final. Staff at the state Department of Toxic Substances Control will spend another year “making sure we have selected the right products,” said the Department’s deputy director Meredith Williams. Regulations would begin in mid-2015. 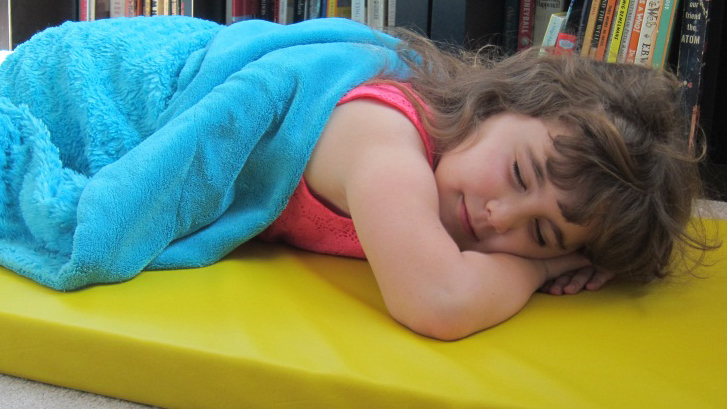 Nap mats were selected because they often contain a chemical flame retardant called TDCPP, or chlorinated Tris, which is known to cause cancer and may also interfere with a child’s endocrine system. Chlorinated Tris was removed from children’s pajamas in the 1970s, over concerns about its health effects, but both it and its chemical cousin, brominated Tris, continue to turn up in children’s products such as nursing pillows and infant sleep positioners. In November, Governor Jerry Brown issued new rules that are likely to eliminate chemical flame retardants from sofas and other upholstered furniture. But despite multiple regulatory actions, “children are still being exposed,” Williams said. The new rules would require that manufacturers of nap mats, crib mattresses and sleep positioners, among other products, first disclose whether their products contain Tris, then undergo a lengthy “alternatives assessment” to determine whether the chemical can be excluded without affecting the usefulness of the product. Other chemicals may be harder to remove. That’s the case with the second product regulators would like to change: a spray polyurethane foam containing a chemical called diisocyanate, which can cause asthma and skin irritation. The third product category includes paint thinners and other products containing methylene chloride, a common solvent that converts to carbon monoxide in the body. Between 2000 and 2011, according to a CDC report, 13 people died while refinishing bathtubs using products containing methylene chloride stripping agents. The soonest consumers might see an outright ban: mid-2016. Both the paint thinner and spray insulation are sold with warning labels, required in California under the state’s Prop 65. But the products are still widely available. Williams says regulators want to encourage both consumers and manufacturers to ask whether the chemical is necessary, and to look into alternatives. If the manufacturer doesn't remove the chemical, state officials could take a number of regulatory options, including an outright ban on products containing it. The soonest consumers might see an outright ban on a hazardous product would be mid-2016, said Karl Palmer, chief of the Toxics in Products Branch of the DTSC. Industry: Rules May Not Be "Legally Defensible"
Today’s announcement comes after six years of stop-and-start deliberations over how to implement the California Green Chemistry Initiative, which voters passed in 2008. As the gears turned in California, federal legislators have been debating an overhaul of the 38-year-old Toxic Substance Control Act. “California decided not to wait," Williams said. "We're moving now, we're naming these products, and we're excited about it." In the press conference on Thursday, state officials expressed concern that weaker federal rules could preempt California’s fledgling program. Another worry is that chemical manufacturers will sue the state, adding yet another delay to an already lengthy process. The American Chemistry Council hinted at such a possibility, expressing "concern" that the safer products program might not be legally defensible. A written statement from the American Chemistry Council, a trade group that represents chemical manufacturers, expressed “disappointment” over a process it considers redundant with federal regulation.